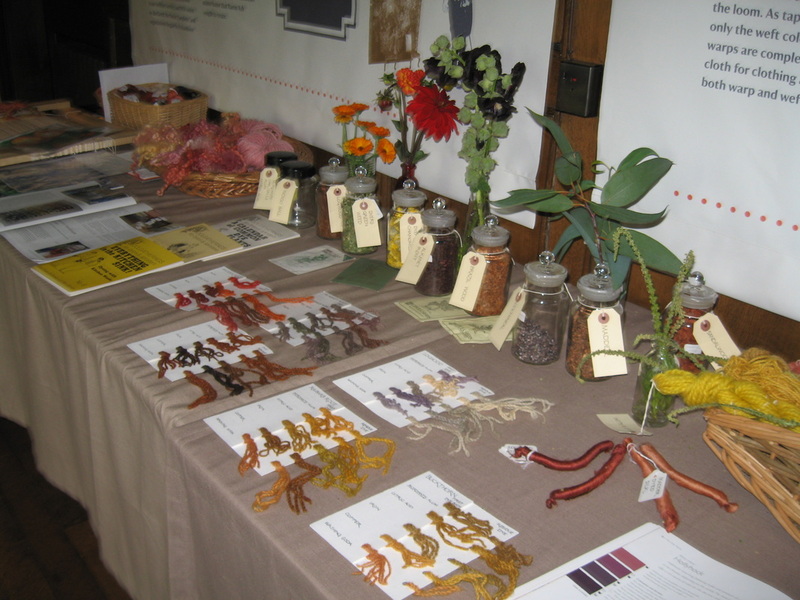 In 2013 and again this spring we showed tapestry weaving at Packwood House with a display of vegetable dyes to show the colours that their collection of tapestries would have been when first woven. After four or five hundred years of exposure to daylight the only colour which has not changed is the blue from indigo or woad, which was extensively used with a variety of yellow dyes to make greens. Visitors were fascinated to learn the reason for all those blue leaves on the trees and had not realized what strong rich colours would have been used in the original work. To show this we started weaving copies of two small sections of two of their tapestries beside photographs of them as they look now. 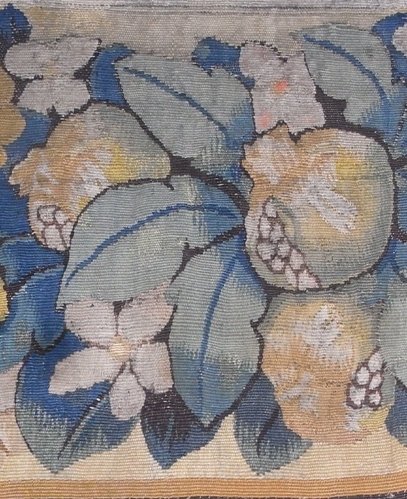 We have an ongoing demonstration with Packwood House, Solihull form June through to October, every Thursday and Sunday, where guild members will be showing the visitors tapestry weaving. Amidst this commitment at Packwood House we will also be demonstrating at various other venues throughout the summer/autumn. Compton Verney will be showcasing “Tapestry: Weaving the century at Dovecot Studios 1912 – 2012” from 20 October 2012 to 16 December 2012. Tapestry is an extraordinary and special art which brings together two worlds to make a new one. At its best, an artist and weavers create a unique work of art in which skill, texture, colour, form and space together spark magic. Stratford upon Avon Guild of Weavers Spinners and Dyers will be setting up a studio within the exhibition space, demonstrating tapestry weaving on Thursdays and Sundays during the exhibition. For the three Family Weekends in December 1st and 2nd, 8th and 9th, 15th and 16th, we shall be leading the weaving-based Family Activities. 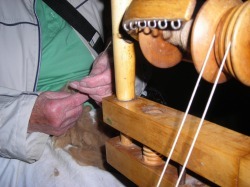 We held 2 mornings of taster sessions for Felting, Spinning and Weaving at the Buzz Cafe in Stratford-upon-Avon. These were Introductory 2 hour classes at £5 each. Numbers were limiited so you needed to reserve your place by contacting Ann Howells annhowells@talktalk.net, telephone 01789 450417, or send a cheque for £5 made out to Stratford-upon-Avon Guild of WSD together with a note of which class and which day you wish to book, and a contact phone/email; to Orchard Cottage, Alderminster, Stratford-upon-Avon, CV37 8NX. 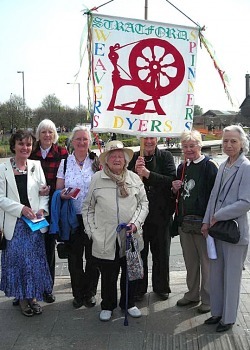 Monday 31st May - Dyeing in the North Cotswolds since 1900"
A group of our Guild members met at the Shakespeare Birthplace ready to join the Peoples' Procession. Our Honorary President, Mary Jeffery, unfurled one of the flags and then joined us as we set off through the town with our banners held high and bands playing. There were people in Elizabethan costume, school children and local dignitaries all carrying spring flowers for the Holy Trinity Church where Shakespeare is buried. There were musicians and dancers and lots of other local groups as well as ours, all out celebrating this very special day. The sun shone and everyone looked cheerful and we all had a very happy time. The Heart of England Alpaca Group asked the Stratford WSD guild to demonstrate spinning on their stand at the last Royal Show, Stoneleigh Park, Warwickshire. We were there on Wednesday, Thursday and Friday 8th, 9th and 10th July. 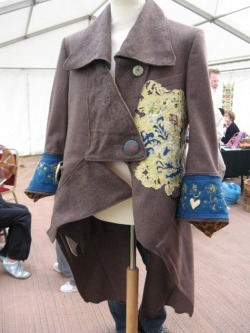 On Midsummer Day, Coughton Court arranged the creation of a modern "Throckmorton Coat" as part of their celebration of 600 years of the same family living there. The original coat had been made between dawn and dusk on midsummer day in 1811 to win a wager made by the then Squire of Throckmorton who had boasted of the speed of his modern methods of producing cloth. The 21st Century coat was made of recycled materials by Pretty Rubbish, but the Stratford WSD guild went to demonstrate some of the different stages of producing cloth. 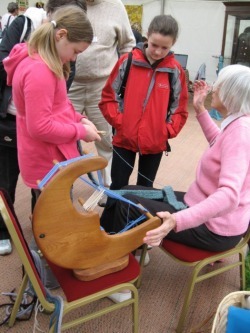 We had four spinners, two weavers and two members with small weaving projects for children to try. 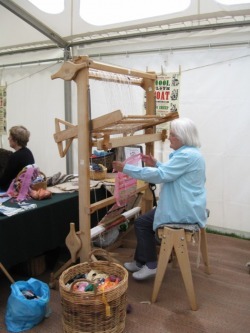 There were demonstrations and lessons in spindle spinning by a member of another guild (who had been part of the recreation of the original coat at the Newbury Show several years ago). There was lots of interest, especially from the children and we all thoroughly enjoyed the day. Saturday and Sunday 13th and 14th June – we demonstrated at Mary Arden's cottage in Stratford for their “Wool Weekend - the Big Sheep Show!”. sit and just spin - what a treat! 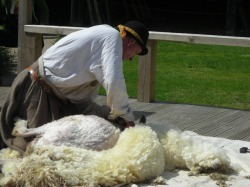 In May 2009, (24 & 27 May), we demonstrated at Hatton Country World (http://www.hattonworld.com) again, on the sheep shearing days, as we did in 2008 (2009 report & photos from Hatton 2008 here). In the past, we visited the National Trust property at Charlecote Park. We demonstrated our crafts in the beautiful surroundings outside the house in good weather, or inside if it was raining. 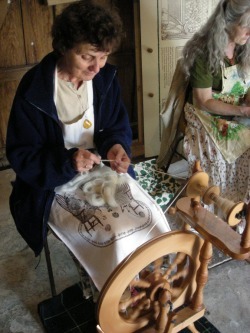 The spinning wheels hold a particular fascination for visitors of all ages and our activities for children, such as card weaving or making “caterpillars” from yarn are also very popular. 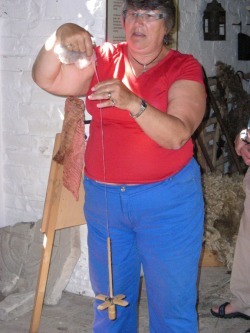 We take along examples of our weaving and dyeing and show different techniques such as stick weaving and braid making. It is interesting to meet people from all over the world and we frequently exchange ideas and learn new things!